Settle in sun or snow with 4 acres of your own forest: find trails, outdoor fire pit, hot tub, playground, soccer goals and deer grazing the fruit trees. Large cottage like home with underfloor heating and wood stove, beautiful spacious open plan downstairs centered around kitchen and staircase. Guest room, t.v. room and bath on main floor. Upstairs find 4 ample bedrooms, covered patio overlooking field and forest, and 2 baths. Keep climbing to a carpeted heated attic space for kids to play and queen futon to boot. 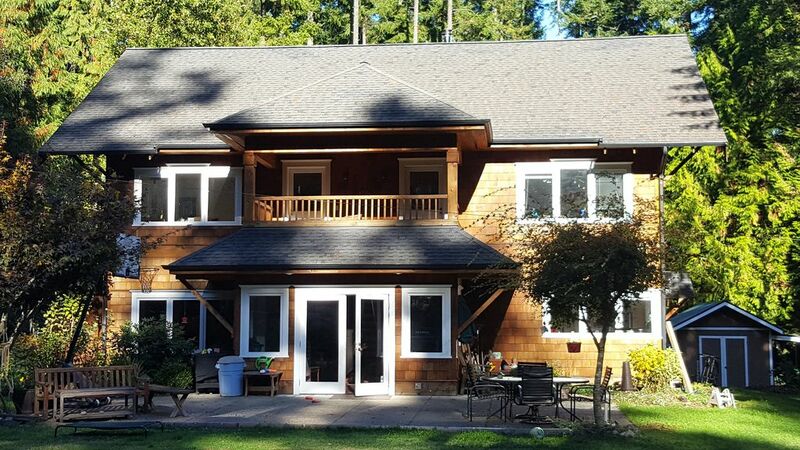 5 min walk to Grand Forest (300 acres of forest trails), 5 min walk to public bus, 3 miles to Seattle ferry. Rental of my bikes and Mini Van can be arranged.